Practice Area: Great practice area includes a driving range, large putting green, short game practice area with sand bunker, and a golf studio with a teaching tee. Description: Feb 2016 Update: The course officially closed and was sold for development. 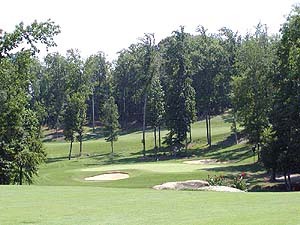 This course is conveniently located off I-77 south of Charlotte on the NC-SC border. The course layout crosses both states, including the 14th hole where you tee off in NC and putt in SC. This well-maintained course is over-seeded with rye for green fairways all year long. Notes: Course offers annual memberships. B-Man's Take: I played this course for the first time in Feb '03. I really enjoyed this layout. Course was in great shape too. The 18 holes mix difficult holes with easier ones, making it a fun round. The course has 5 par 3's, including the signature 17th over water. My favorite holes have to include 2 of those par 3's, the 206 yd #4 (since I birdied it) and the 194 yd #17. The most hellish hole is the 467 yd par 4 (!) #8 beast. A great drive still leaves you 220+ approach to a green you can't even see from the fairway. Nothing to it though, B-Man landed his 3rd shot from 150yds within 10 feet and made par! Overall this course is a must play, fun for all handicaps. 2/22/16 - Regent Park is no longer open for play as of 2/22/16. The course is being sold for development. 11/16/15 - Msg Board Posting by dongtrgolfer titled "Regent Park"
7/27/15 - Msg Board Posting by Jamie titled "Regent Park"
GolfHoles.com - Photo tour of all 18 holes.